The suspension and pulling power built into the Ford EcoSport allows the vehicle to tow a 1,400-pound trailer if the car is equipped with the Turbocharge 1.0-Liter engine. The towing capacity rises to 2,000-pounds if the car comes with the Turbocharged 2.0-Liter motor. To add more pulling versatility to the EcoSport, the engineers added a tow ring to both the front and the rear areas of the frame. 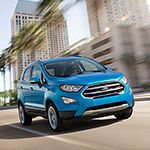 Come to Lithia Ford of Missoula for a demonstration of the towing capability of the Ford EcoSport.